Green Smock Top. Very loose fitting tunic maybe short dress? Size 20 Maternity? Smock Top / Dress by George. Very loose fitting. So loose, it could probably be used as a maternity top/dress. Tunic length. Ivory floral. Underarm to Underarm 23". Label Size 18. Shoulder to Shoulder 17". Inside Leg -. Condition Excellent. 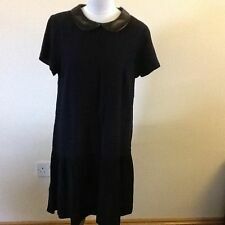 George tunic style dress. Chest (armpit to armpit) approx: 19". Length (back of neck to hem) approx: 35". Has light deodrant marks. 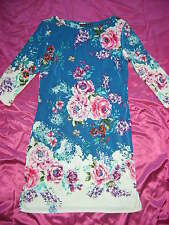 Figure flattering tunic dress, floral print, perfect with boots for spring. Bought but too small for me and just been hanging in my wardrobe. CHUNKY ZIP TO FRONT. ALL SOAP CUP CAKES. BATH BOMB CUP CAKES. BODY SCRUBS. BODY BUTTERS. CHILDREN'S MINION INSPIRED BATH BOMBS WITH CHOSEN SURPRISE TOY INSIDE AND GOOGLY EYES. FOR BEST RESULTS AND OPTIMUM FRESHNESS. Pretty Navy Floral Patterned Stretch Tunic Dress Nee Size 12. Tunic style above the knee in lovely navy floral pattern. Lovely quality polyester fabric with 5% added elastane for stretch and perfect fit. Perfect condition. New with tags. Thank you for looking. Frilled Sleeves. Criss Cross v Back Feature. 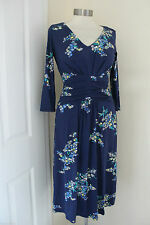 Size 12 George Black Floral p ull on tunicDress - easy to wear. Ladies George 3/4 Sleeve. Drop Waist Black/Grey Mix. Elasticated drop waist, neck and cuffs. Mini Dress. 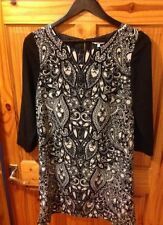 BEAUTIFUL GEORGE TUNIC TOP IN BLACK AND SILVER - HAS 3/4 SLEEVES - ROUND NECK - WAVY PATERN - SIMPLE A LINE STYLE - SILVER THREAD PICKS UP SURROUNDING COLOURS - STRETCHY MATERIAL - MACHINE WASHABLE. LENGTH - 33". Lovely smart lined dress. Has see though long sleeves. Chest (armpit to armpit) across approx: 20".